I've seen a lot of posts about the new Lula, but I haven't seen this image widely posted. I think this is my favourite page in the magazine: Eva Mendes in See by Chloé. I just love it and I find it hard to explain why it's my favourite. 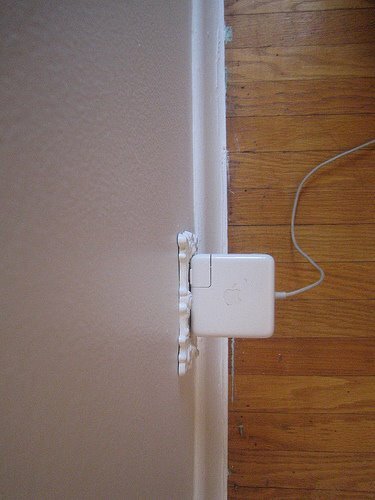 It has a lot going for it, though! That dress! It also makes me so happy to see this beautiful girl dolled up like this. She is so stunning and deserves better than what a men's magazine would give her. I love her in this little hair bow and with a hint of pink on her cheeks. Thank you for putting your names into the hat for the issue of Frankie! Thanks too for saying hello, if you haven't before. Hello, hi, welcome, thank you. I know an issue of a magazine is just a little thing, but it's worth its weight in gold. Seriously! I ran the numbers through random.org and the winner is Ana Laura Perez! Congratulations, Ana Laura. This image, from Lover, went with me to the thrift shops yesterday, and I ended up having some good luck! I found two things that have been on my mind lately. I love straw hats. I have owned a number of them and I love wearing them in the summer. After seeing Lover's Sacred Hearts collection, I wanted one that was more boater-like, with a black ribbon. I found this one for $2 -- it's not quite the same shape and I have to work on getting the brim more flat (heavy books? Some steam? Can you shape straw?) because it's a bit warped. It had a pink ribbon on it but I replaced it. These hats always make me think of Marguerite Duras' The Lover -- which I suspect is a book that is beloved of Susien Chong as well. They also make me think of a time when people hung straw hats decorated with fake flowers on the wall, usually in kitchens with duck motifs. Oh dear. Just like everyone else, I've been hunting for a sailor-collared shirt for a while (I actually made one out of a lightweight wool in the fall but I never finished it!). I really love this blouse -- it looks much better worn than on the hanger. It's an XL but the fabric is so silk-like in its drape that I'll be able to wear it in a slouchy way. You can't see it here because this picture is so washed out, but it has a pale gold trim all the way around; I think I'm going to replace the buttons, though. I also found a linen Laura Ashley drop-waist sailor dress and another dress with a sailor collar but I was out of money (sigh) and had to leave them behind. Apparently it was '80s day at the thrift shop! It would appear that I wished you a happy weekend prematurely, because I have something else to write about: Frankie magazine. This is the only magazine that makes me regret that I dropped out of journalism school (but not really) -- it's funny and smart and oh so pretty. Last night I had a dream that I was going on a trip to Melbourne and I was using Frankie as my research guide. This morning I walked to the subway and stopped in at the magazine shop on the corner. I found the current issue of Lula (there was only one copy left!) 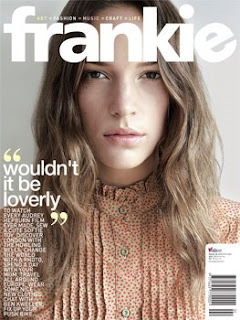 and the current issue of Frankie. Since I love Frankie so much, and since you've all been so sweet with your lovely comments, and since I bought an extra copy, I'm going to give it away! Some of you might not be able to find it where you live, some of you might not be in a position to spend $15 on a magazine right now, some of you might never have seen this wonderful, beautiful magazine in person. Let Frankie be your new BFF. Please leave a comment here if you're interested. I'll randomly select a winner on Sunday evening (say, 9 PM my time). I bought this dress last night. Apparently I want to look like a flower. I had come across the same dress in white earlier this week but since it wouldn't fit me, I simply saved the images for inspiration. When I saw it in fuchsia, which I think is a very nice colour for brunettes, I snapped it up right away. Enjoy your weekends, and your first taste of spring! We have a couple of apartments to view this weekend. One is on the Brock end of Little Portugal, one is on the Landsdowne end of Bloorcourt. I like them both so far, although I fear there will be competish. Your apartment-hunting goodwill is appreciated! There is a reason why I rarely look at eBay except when I'm looking for serger needles. eBay makes me crazy. I saw the dress above today and my heart literally began to race. It really did (I don't use the word "literally" lightly)! I thought it was the most perfect dress ever for me -- oh the 38" bust! The rare 38" bust on a vintage dress! It had 17 bids at the time but I thought I would for sure win it and started picturing myself in it. So I stared at it, I bookmarked it, I walked away, I pulled out a measuring tape, I closed the browser, I added it to my watch list, I tried to stop thinking about it, etc. 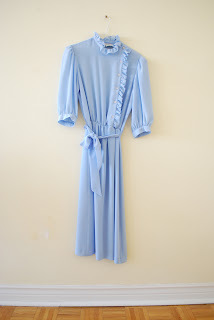 Finally I put in a maximum bid that I thought was kind of insane for what is, essentially, a polyester tablecloth dress. I was outbid and now I am petulant. Maybe it's the eBay boomerang; today I was wearing the jazz shoes that I got as the result of a fierce bidding war. I played dirty in that one, oh yes I did. At least I have a lovely tablecloth that Claire sent me a while ago and new serger needles. I'm not one to browse Flickr groups very often (forget groups, I am never caught up on my contacts list), but this one is one that I love: My Life Is Beautiful As Is. It was created by simple moth, whose photographs are absolutely stunning. She is a sweetheart, too. Domesticity, homesteading, crafting, motherhood, food. We want to see the lovely moments of your life in their purest form. We want your photos to tell a little story - to share a little piece of your personal life. I love the photo pool -- it is quiet, and beautiful. The above is a contribution I made today, of a little beaded collar I found in an antiques market and will be selling in an upcoming rummage sale. I'm pleased to write that the lovely (and oh-so-patient) Marichelle of Heart Handmade asked Geoff and I to be a part of the sweet "Other Half" feature. Our interview will run on March 31. It was so fun to answer the questions about me & Geoff and us, and such an honour to be asked. It's a favourite blog of mine and it is always, always inspiring. We're in amazing company there. Thank you, Marichelle! I was thrilled to see an interview with Caitlin of Nice there today! I've mentioned it before but Caitlin was one of the first people I met through Etsy -- she's just about the most darling person that could be, and her work is so beautiful (and I have to add, she has incredible taste in music and in cardigans). I am lucky to have received a few treats from her over the years. Read the interview with Caitlin here. Thank you all for your lovely comments about Bakers Dozen! I've been glowing all day and I am so grateful to Amy. What a sweet project. 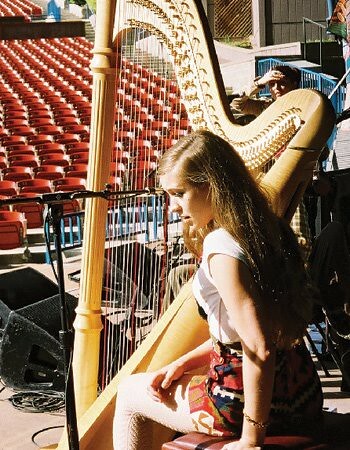 A few people have commented on how much they love Joanna Newsom. I love her too! I'm not really a quotation-loving person, and so I thought I would provide a little context. This was the last question and answer from the interview, and it is so wonderful. BLVR: One final question -- if you could know the day and time of your own death, would you want to know? Or would you rather not? JN: If I could be assured that I'd be old, then yes I'd want to know. But I'm so easily made sad that if I found out I was going to die on my thirtieth birthday I'd probably cry every day between now and then. I can't fathom myself making peace with that idea. I really like being alive. A lot. I'd never want to know, because of the possibility that it's sooner than I'd want it to be. I'd be grieving for my own death every day. I don't think it would make me more productive. Some people get empowered by it and live these really rich beautiful lives. But I don't need the fire behind me, like "You're going to die on your thirtieth birthday, so get cracking, kid!" I'm perfectly happy just to exist. 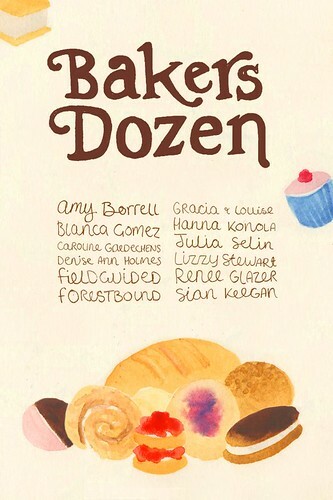 I'm so excited and proud to announce a project that Fieldguided is participating in: Bakers Dozen. 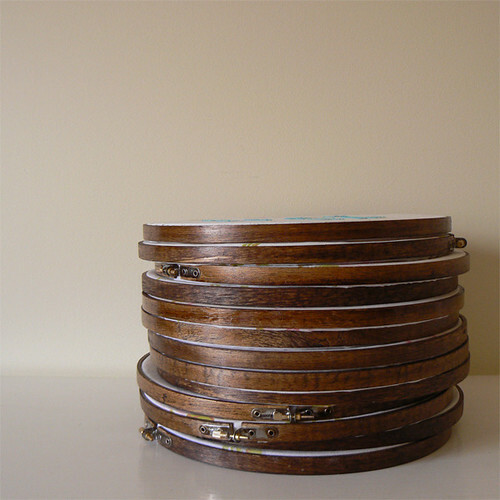 This project was created by Amy Borrell and I was so happy when she invited us to take part. 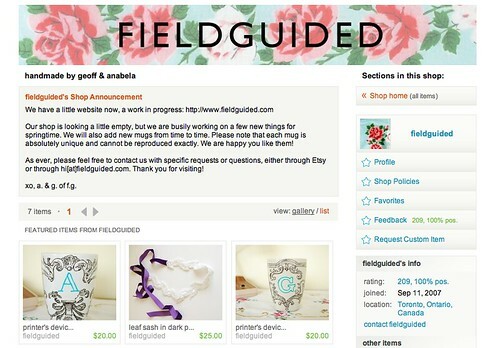 It's pretty amazing to see "Fieldguided" next to some of these names! I didn't know who was going to be involved in the first go-round and it was so fun to look through and see who else was there. Also fun was seeing the countries that are represented: Germany, Sweden, Finland, Spain, Australia, the UK, etc. I love the pictures she took of our contribution. 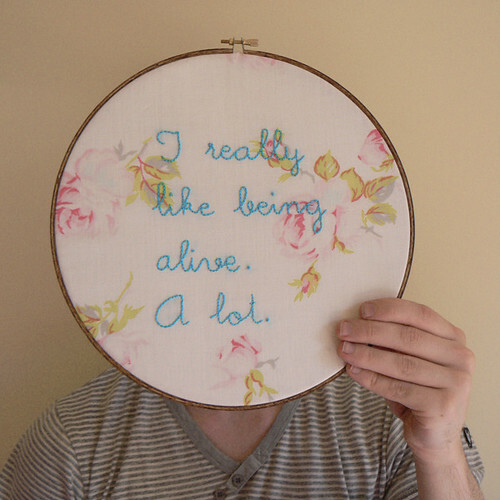 I embroidered some text from an interview with Joanna Newsom in the Believer in 2004 -- I remember reading it on the subway and it's never left me. It's such an off-the-cuff, pure statement, the kind of thing she probably said in surprise in response to an unusual, unexpected question. 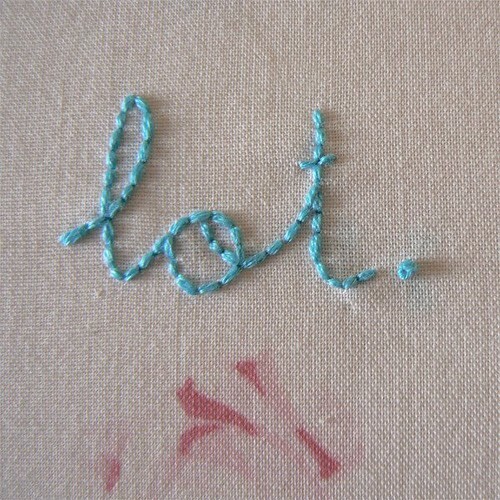 I liked the idea of meditating on such a statement by embroidering it over and over. Please do check out the site -- Amy worked so hard on it and it's quite beautiful. Also note that prices are in Australian dollars! I want to buy one of everything else. 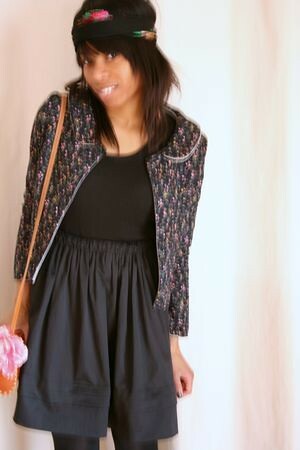 I've been thinking about quilted floral jackets a lot. Are you tired of the prairie thing? I still like it, unless it is really over the top. I am not sure if I should try to find one, but here are a few ladies who make the Gunnies look so good. I love the Barquentine skirt from Makool. Isn't it lovely? And not to brag or nothin', but I won a giveaway yesterday! And it couldn't be more perfect: I won a beautiful patchwork scarf from Ambika via A Cup of Jo! It was obviously my lucky day. I found some pretty floral cotton lawn recently, and I cannot get enough of it. I love it and its Liberty-like glory. 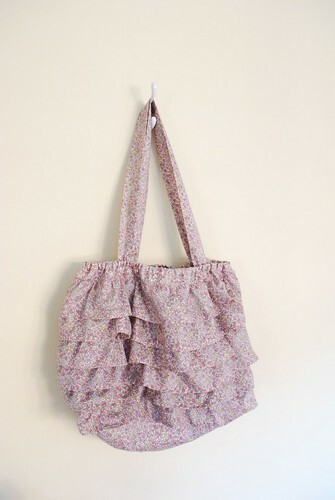 I made some needlebooks with it, and a tiny skirt, and this lightweight puff tote. I would love to own a Sessùn Piou bag, but for now, this will do. It has ruffles aplenty. The image of baby bloomers comes to mind. I know. 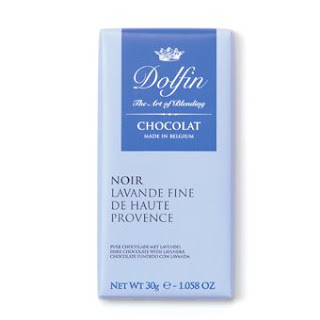 It is lined with satin in the most delicious shade of mauvey pink. 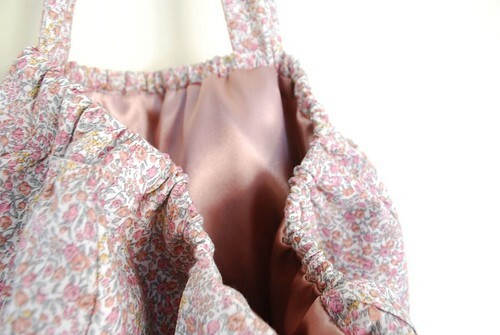 It is much more sturdy than it looks, thanks to the wonderfully thick sew-in interfacing I used. I find the size of it to be satisfying, as well. It's not too small, not too big. 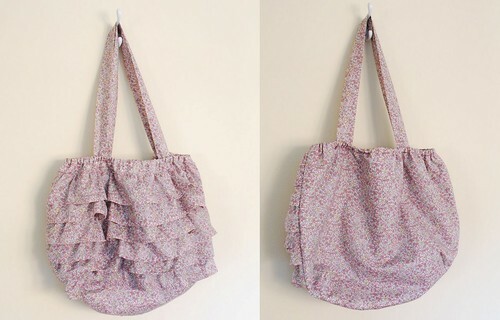 I may tweak it here and there (handles -- shorter, interfaced, or perhaps made of some faux leather braided trim I have; fewer ruffles, larger ruffles), but I may make a couple more for the shop. Does that sound like a good idea? Geoff and I (but mostly Geoff) worked on a new banner for the Etsy shop this weekend. This handkerchief, purchased at Southworks in Cambridge, is apparently my muse. It features the most vibrant, beautiful colours. I love it. It took me some time to fully explain to Geoff what I wanted in a font; the font I had in mind all along, however, was the iconic Penguin Books font, Gill Sans. Now if only I had some new things to put in the shop! More on that later, I hope. 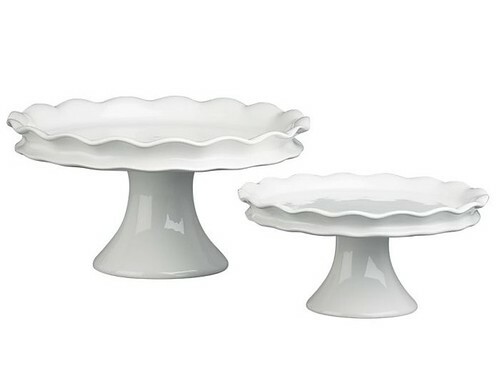 We've been doing a bit of baking every weekend, and even though the things we make usually don't stick around long enough to be displayed in a pretty way, I keep thinking about how I'd like to get one of these ruffled cakestands from Crate & Barrel. 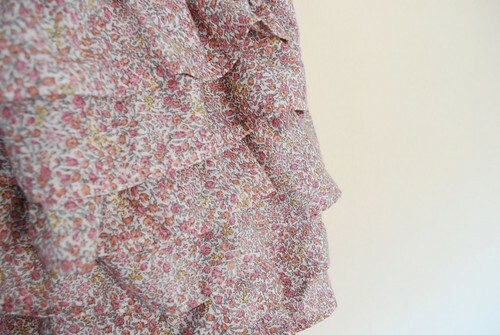 My love of the ruffle extends to the tabletop, oh yes it does. I know a lot of us feel overwhelmed by the astonishing number of incredible ideas and images and thoughts we read or see in a day. I often find myself absently scrolling through my blog feed, just to see the number in bold go down -- and then I think about how funny it is that I can look at all these beautiful things and not even really notice them. I do absorb them, though, in some way. They seep into my subconscious and I dream about them. Certainly nowhere near as beautiful as the Chloes, but they'll do for me, especially since they were $7. Thanks, blogs!